Lamington's Hidden Cemetery ~ The History Girl! Off the beaten path in the Lamington section of Bedminster Township, New Jersey along an unpaved road is a cemetery up on the side of a hill along the roadbed. If you didn't see the wrought iron fence at the top of the hill and a set of stone steps leading up to it, you wouldn't know it was there. Behind this cemetery's gates rest the souls of the nameless and forgotten. Small white wooden crosses dot the landscape. There is a serenity to the grounds, which are surrounded by a grove of pine trees and thick forest. A small stream meanders along the back of the property. This small piece of property is only one of a handful in New Jersey; it is Lamington Black Cemetery. Within the Lamington Black Cemetery, sometimes referred to as the Cowperthwaite African American Cemetery, there are 97 known burials; 36 with names and 61 unknown. A number of traditional markers dot the cemetery but there are also a number of plain fieldstone markers with no inscriptions and rows of sunken unmarked graves. At least five buried here were slaves to local landowners, manumitted in the 1820s and 1830s and two served in the U.S. Colored Troops during the Civil War. However, nothing is known about the 61 who remain nameless. It is believed that some of these unmarked graves were those of other slaves, buried without a coffin and left undocumented. The name Lamington is derived from the Native American word Allametunk, meaning "place of paint clay." Other versions which have appeared in historical records include' Lamintunk, Lamentunk, Lametunk, Allamatunk, Alamatunk, and Laomatong. 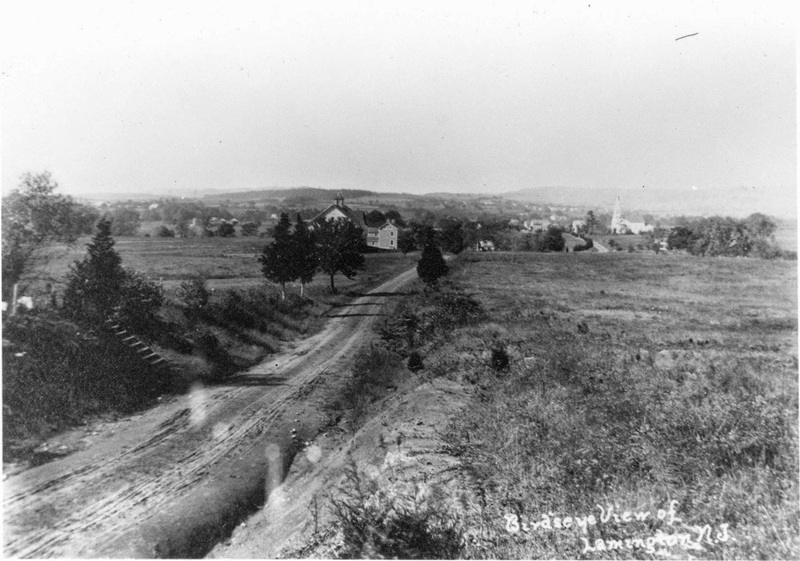 A small community focused around the Presbyterian church and a school, Lamington was like most rural farming communities in Somerset County. By 1850, the community contained a number of homes, a blacksmith shop, and wheelwright shop, in addition to the school, church, and parsonage. Lamington was home to free blacks prior to the Civil War and the cemetery is first noted on a map dating to 1873. However, the earliest record of the cemetery was recorded on a deed dated June 1, 1857, when Martin Kline conveyed .34 acres to the Trustees of the Presbyterian Church at Bedminster in the Counties of Somerset and Hunterdon for $55.00. Birdseye view of Lamington, circa 1900. The cemetery can be seen on the extreme left. From the collection of Mrs. George Ray. Clarence Dillon Public Library and the NJ Digital Highway. Grave marker of Harriet, wife of Samuel Henry at the Lamington Black Cemetery. According to the 1984 National Register nomination for the Lamington Historic District, it notes that at one point there were twenty-five black members of the Presbyterian Church in Lamington. In The Ragged Road to Abolition: Slavery and Freedom in New Jersey, 1775-1865, author James J. Gigantino mentions that African Americans at the Lamington Presbyterian Church had to use a separate balcony. Today, the only reminder of the once-sizable population of African-American population in this area is the cemetery. Although the cemetery was forgotten and abandoned for quite a number of years in the twentieth century, it was rediscovered in the 1990s by the late William "Buzzy" Hundley. Hundley saw the condition of the cemetery and assembled a group of volunteers to clean it up. Through the efforts of Hundley and many other concerned citizens, the cemetery was cleaned, preserved, and rededicated on October 7, 2001. After its rededication, Hundley conducted tours of the cemetery for school groups until his death in November 2010. The cemetery is included in the boundaries of the Lamington Historic District, listed on the State and National Registers of Historic Places in 1984, ensuring it protections to continue telling the narrative of slavery and free African Americans in this section of Somerset County. Most interesting! Thank you very much. History is important. Your efforts are very commendable. Well done! I photographed this cemetery in 2013, and am exhibiting some of those photos for Black History Month in Piscataway Township next month.